I am Lisa,my husband & I own a couple of villas in Coral Bay, we emigrated to Cyprus in 2006, with our 2 children. Our children now attend the International School & love life here.We bought a lump of mud on honeymoon and had our holiday villa built in 2001 , we initially lived here whilst we had our house built and we started renting it out 9 year ago and having been holiday makers knew what people looked for, it proved very successful so we have expanded purely in this area looking after properties from neighbours and friends and buying a couple more ourselves.Felix and I personally look after our villas & cater for you should you want us to. . We live locally (5 mins drive away) we can provide that added extra personal service, you can not often get, ie. sorting cars, taxis. We are both UK hospitality trained so offer meals on arrival, barbecues prepared just for you, beer in the fridge or wine from a local vineyard. We personally visit you after your arrival and are only a phone call away for your entire stay. This property was bought due to its breathtaking views. panoramic sea views, peace and tranquility. Its very modern and spacious, contemporary design, lounge/diner and kitchen to first floor to take advantage of the amazing views. Three large bedrooms and two bathrooms to the lower floor, leading to the outside sunbathing areas and barbecue plus pool area. stunning location amazing views both by day and night fabulous sun sets peace and tranquility. large open plan and airy villa External dining and lounge areas. Two bathrooms plus wc. covered outside parking on the drive. There is a dining area opposite the kitchen with a large table and 6 chairs. Views out over the balcony over Peyia and down to Coral Bay and the sea. Downstairs there is a large patio area with outside table and chairs for 6 people next to the BBQ. Fully fitted kitchen with breakfast bar, integrated electric oven and grill, electric hob, fridge freezer, microwave, washing machine, Dish Washer, iron and ironing board, toaster& kettle. Large fully enclosed beautiful garden, panoramic views, mature planting, side garden with sun loungers adjoining the barbecue area.Amazing views of the sun setting over the sea. all bedrooms have patio doors leading directly to the pool terrace with sun loungers and the beautiful views. Coral Bay is approx 1 hour 30 mins from Troodos Mountains the ski season is December to March, with 10 different runs for all levels, this area is beautiful out of ski season and known for biking and hiking. Ski by morning sun bathe back at the villa by afternoon! Both the big hotels in Coral Bay have tennis courts you can hire by the hour. Paphos is the golf resort of the island, with 4 courses . The wonderful Aphrodite Hills is East of Paphos, it’s a champion standard course being par 70/71 and 6232m, complete with excellent on site facilities and spa for those who don’t play golf! Secret Valley currently and 18 hole course again East of Paphos, panoramic views and is par 72 and 6120m, it is currently being extended to a 36 hole course! Menthis Hills, this is 20 mins away an elevated position 550 metres above sea level ensures cool breezes in the summer, its again par 72 and 6060m, it has been redesigned and constructed in summer 2007. A fabulous new golf club opened in 2012. Elea golf club beautiful greens, stunning views, lovely club house. PAR 72 course! Driving range 15 min drive, with pitch and putt, great fun. Everything was OK. The welcome pack was appreciated as we arrived after dark. The property was a little difficult to find in the dark as the landmarks mentioned were difficult to see; a little map would be useful. Enjoyed a morning cuppa and breakfast outside in the sun (except at the end of our stay when we had some interesting weather- thunder, lightning and hailstones! Did not realise Cyprus has UK type 13amp sockets and had taken European style leads with us! we are so glad you had a lovely stay with us and have already recommended us to your friends. we are very like the uk with driving on the same side of the road and our plugs being the same. the views of the storm must have been amazing form the villa! not what we expect for this time of year though but our winter has been the worst since 1906! you get the google co ordinates so many guests put this in their phone to help guide them but as there is only one turn when you get to peyia we havent lost anyone yet! The location of the villa is amazing and the mature gardens are beautifully well kept. The welcome pack was a lovely gesture.The inside of the villa is showing it's age and needs some remedial work. There were endless light bulbs that didn't work, cracked and broken plug sockets and a bedside lamp with a big crack down it. The air conditioning is restricted to 2 hours blocks by a timeguard system but you can't even reach to turn this on in one of the bedrooms as it's behind the bed. On our second day the water pump failed leaving us without any water and unable to flush the toilets, this was resolved the following day but highlights the age of the property. The cleanliness of the villa on arrival was disappointing, there were established cobwebs in many of the rooms and bed linen and towels although clean were stained. This is not what we expected from a villa advertised of this standard. During our stay we also discovered a leak under the sink when we got up one morning to find a puddle on the kitchen floor, this was obviously not a new problem as on inspection we discovered bowls stacked under the sink to catch the water. We were told that the pool would be cleaned at least twice a week during our stay, we certainly never saw any evidence that the pool was cleaned; it was pretty dirty by the time we left. We do know that someone visited though as the net we had been using to clean the pool daily ourselves was broken when we returned home one evening mid-way through our two week stay. We were never offered meals or BBQ packs as is suggested in the villa description. The description is misleading, it is not a 'Lovely brand new villa' but in need of some maintainence and TLC. very surprised to read any of the above as the villa certainly isnt dated and in need of modernising and showing its age! look at the other reviews,it cant have changed that much in two weeks. you met Felix on several occasions and he does your pool which was kept in perfect condition so how you can say it wasnt cleaned nor did he turn up and break a pool net!!. why would you not mention a leak to him or text or email but chose this forum to complain when nothing can be done as you have departed ( the bowl under the sink is called a washing up bowl as some guests like to use them) I checked the villa on your departure and removed all your rubbish and only one lightbulb was out? lightbulbs will pop during stays and again Felix has a supply in his truck. the pressure pump did unfortunately fail and you messaged on a sunday evening at 5.44pm and Felix got an engineer the next morning to replace, this does not show the age of the property, things can break at any time and any age unfortunately but we resolved the next morning , you still have water it just means the pressure was slower. he also sorted the timers for the ac for you so they werent on timer but you dont mention this in the above?? I am confused as to why would we offer you a meal or barbecue? as per our description we can provide a menu and meals and barbecue packs but the guest has to ask, or we dont know! again you never mentioned this to Felix or myself or we would have been happy to provide you with a menu, it would be very presumptious for us to assume you wanted food! Lovely Secluded Villa.....and gluten free bread ! The kids and us loved the warm pool and the space the villa offered. we are so glad you had a lovely stay with us and that you would return. we were so pleased to be able to source you a gluten free loaf to add to your welcome pack, we know its the little things that can help make the holiday that bit better. its lovely for future guests to hear about the space, standards etc. We really enjoyed our stay at this villa in June of this year, the views are the best we have had whilst staying in Peyia and we have visited many times. The gardens are far more mature and beautiful, the pictures don't do it justice at all. The area surrounding the villa is undeveloped so the location is very peaceful and we woke up to bird song and sunshine just the thing for a relaxing holiday. The villa itself is spacious, modern and well equip and the owners left us a great welcome pack so we could make a drink and a snack on arrival. Everything was clean and tidy for our visit. We spent a lot of time soaking up the sunshine around the pool, having the table and seating area to relax on the terrace was a bonus, my partner loved the BBQ which is more like an outside kitchen. In all we had a great visit and would love to visit again in the future. thank yo so much for taking the time to write such a lovely review.the views are really stunning at the villa and the peace and tranquility, hard to portray on photographs. we are glad you found the standards high in the villa and loved the mature gardens ad barbecue area. We returned to Paphos for the 3rd time to celebrate our wedding anniversary. We decided to book a villa in Peyia this time round as that's where got married 4 years ago. We chose this villa due to it being a newly built modern one. I think the pictures were taken a few years ago though. Highly recommend this villa if you want an out of the way, quiet holiday. Villa is situated very high up in Peyia giving the most amazing views. Stunning at night. Would strongly suggest hiring a car though..you'll need it. We used Zest online, they were the cheapest and only needed a £250 refundable deposit . All others wanted £800!! Had a few teething problems with the cleanliness of the villa, the bedding and ripped loungers. But Felix came round and sorted the problems. We were given full use of the villa all day on our last day, as we had a late flight. So this was a welcome bonus. Having use of the Kodi box was a plus at night...we sat down for a family film session most nights. Screen turns green regularly though, but switches back eventually, you soon get used to it. Fly screens across all the doors was brilliant, as there are quite a few insects with being up the hill. Air con in each room was great, all worked fine. Plenty of storage space in bedrooms. Use of two seating areas on the balcony was great, but needs another set down on the bbq patio. Plenty of places to eat in Peyia and Coral Bay. Highly recommend a trip down to Vardas in Kissonerga. They have the best sunset views while you eat. Staff are amazing. Harmony restaurant on the main road opposite the turn in for Vardas is also a great place for food. Again, the staff are fantastic. Pop down to Haris for breakfast...they have the most amazing full english options with beautiful coffee. So cheap too!. **Tips for Owners/management team**..... The garden area at side of the pool could do with a serious clear out so you can fit the loungers on there. People with kids wouldn't be able to see them from the bbq patio. The pictures show a completely different look...much more minimal which is what it could do with.Plus the pool is full of garden debris every morning. The parasols need to be replaced, especially the balcony one, the metal spikes are all poking through, very dangerous. Tiling downstairs in bathroom/ensuite needs re grouting. Hi thank you for taking the time to write a review, the views are stunning from this villa. shame you didnt get chance to eat at the old cinema which is known for its amazing full and half mezes to experience true cypriot style and only a few minutes from the villa, or Yialos being much more local than vardas and offer amazing traditional cypriot fayre, great prices and cliff top position, very popular for the best photo opportunity O Niros with stunning view, modern feel and great cocktails and european food. we recommend our guests using U2 car hire, they dont charge anything for a deposit so better than the above or some other quotes you got, the also meet you in arrivals and take you to the villa free of charge so no car hire queues and no getting lost and their price include fully comprehensive insurance with a zero excess. You arrived at the villa 5 days after your family, your husband on speaking to felix after arrival was delighted with the villa but on your arrival you had some issues very difficult for us when your family have been in nearly a week, so glad everything was resolved to your satisfaction. week and you have a pole and net which people use for stray leaves in between. we have a smoke detector in place? 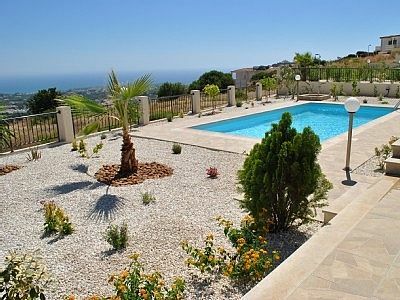 First trip to Cyprus – stayed in a wonderful villa that has everything that you need to enjoy your holiday. The welcome pack was an added bonus, especially as we arrived after midnight, also the recommendation of U2 car hire, Michalis was very helpful and friendly, picking us up at the airport and taking us straight to the villa, much appreciated. The villa was clean throughout, peaceful and has fantastic views. Definitely one to recommend. thank yo for taking the time to write a lovely review, we are so glad you had a great holiday with us, glad you enjoyed the welcome pack, it just helps guests so much especially on those late arrivals. we have used U2 car hire for years they are so professional, look after our guests from pick up and the cars are well looked after. Due to its location it is ideal for those wanting to have a water sports holiday, there are many diving schools locally with everything from beginners courses to some superb wreck diving for the experienced diver. Georges Ranch for those who like horse riding is a 5 minute drive. Due to the climate it is popular for both walking and cycling holidays plus the benefit of the 3 golf courses meaning there is something for everyone. The villa was chosen for its position between two of the best beaches on the island. The beaches are both 5 minutes away, the villa is equidistant between Coral Beach and Coralia Beach, both blue flagged beaches, they both offer a range of water sports, changing and shower facilities and snack bars. The nearest airport is Paphos which is a 30 minute drive. Larnaca is 1 hour 30 mins. The bus stop is 5 minutes down the road and runs every 10 minutes in the summer, 20 minutes in winter late into the night into Paphos and onto the Water Park. A taxi from the airport is approx 45 Euro for 4 people which can be arranged.We can also assist with car hire. Harbour and Water Park, 20 minute drive, Polis and Latchi 30 minute drive.Coral Bay is approx 1 hour 30 mins from Troodos Mountains the ski season is December to March, with 10 different runs. Peyia Village is about 1 kilometer away from the villa. Most of the walk is along a flat road, at the end there is a bit of a hill to take you into the village centre. In the Village there is a supermarket and a bank. There are a number of great Bars and Restaurants all in close proximity to the village centre. Coral Bay has a range of shops, restaurants, supermarkets and banks. Two of the local hotels have excellent gym, spa and swimming facilities. The local beaches all have a variety of watersport facilities and there are two PADI dive centres in Coral Bay by the Frog and Toad. There is also a car hire centre who will deliver cars to the villa with discounts available for people staying at the villa. We live locally and will be happy to give recommendations for sports activities, shops and restaurants.